When the blue sky turned dark, white puffy clouds become grey with heavy rain clouds, tweeting birds on tress flew back to their nests, people on streets wearing sunglasses and t-shirts removed their rain coats and umbrellas, I went and sat on my favourite window seat gazing at the heavy rain drops flirting openly with tree leaves, and kissing beautiful flowers in our garden. The book I was reading with much enthusiasm and interest was left lying next to me on the floor, completely forgotten and abandoned, with in a minute as I admired the rain drops hitting the bay window and elegantly sliding down and then gently kissing the flowers planted on window box. Everyone has favourite season… I love them all! I love spring, summer, rain and snow… I love first blooms in spring, smiling sun in summer, refreshing rain in Monsoons and snuggling with loved one in winter. And yet, I am bit partial to Monsoons. It may be due to happy memories I had from childhood to adulthood. Or it may be because of my memory of dancing on terrace, with my siblings, matching steps with every rain drops. Or it may be because of small naughty girl in piglets who loved to jump on potholes filled with muddy rainwater and splash it on innocent passerby! Or it may be because of young teenage girl who thought Monsoons to be the most romantic time of the year and dreamed of meeting her soul mate on beautiful rainy day, surrounded by lush greenery. There may be hundreds of reason as why I love Monsoons and it’s impossible to write about them in just one post!!! But I have to let you know one of the main reasons for my love for Monsoons. Are you curious to know that? Well, there is no surprise here as it’s the most amazing food cooked by my Amma during cold, wet Monsoons that comforted me with its divine taste and spread its warmth in my heart and soul with all the love that she put in to it for her family and loved ones! Yes, its food after all that brings family close…and also gaps the distance between people and regions! While reminiscing on old, happy memories and thoughts, the sudden rain in my neck of the wood gave me new cravings, a craving for some deep fried ‘sins’ as I call! Deeping frying in our home is a rarity and almost a taboo when I am seriously working on loosing post pregnancy weight for last few months. But I am just a human after all. When Gods and great sages have fallen in to traps and committed great sins, what more can be expected from simple ‘Mango’ people? 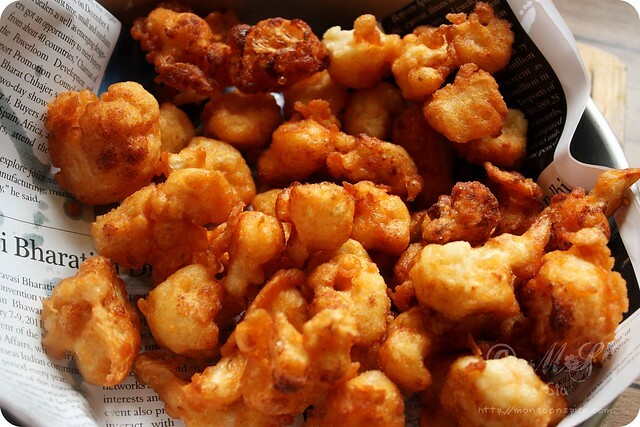 My great sin was deep frying cauliflower florets dipped in spicy batter in the form of famous Gobi 65. This recipe of Restaurant Style Gobi 65 was written on my recipe diary long back and regretfully I forgot to write down the source. I know this is my second sin, not writing down recipe source! So if you see any similarity to any Gobi 65 recipe you have come across, please let me know. I will rectify my mistake and give due credit to the original recipe and author. 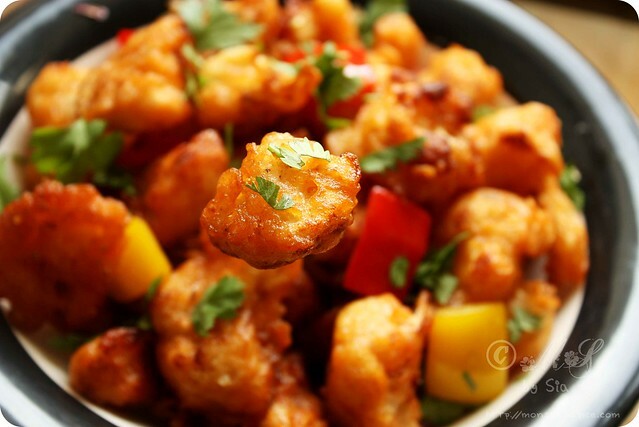 Coming back to recipe, this Restaurant style Gobi 65 is actually a very simple dish. Please don’t be daunted by the lengthy ingredient list. Everything comes down to preparation and the rest, well, is just sinful as all you are left to do is deep fry and eat, eat and eat more! Prepare the batter well in advance and marinate the cauliflower florets for good 4 to 6 hours if you want to get that restaurant taste of Gobi 65. Short on time and have no time to marinate? No problem, just skip marinating and still you will end up having delicious plate of Gobi 65. I have tried cooking both ways, marinating and sans marinating, and believe me both tastes scrumpticious! And I almost forgot to mention, you can add pinch of artificial red food colouring as they do it in most restaurants to get fiery red coloured Gobi 65. Also addition of Ajinomoto or Chinese salt is optional. I skipped both as I am not very keen on using artificial food colouring/agents. 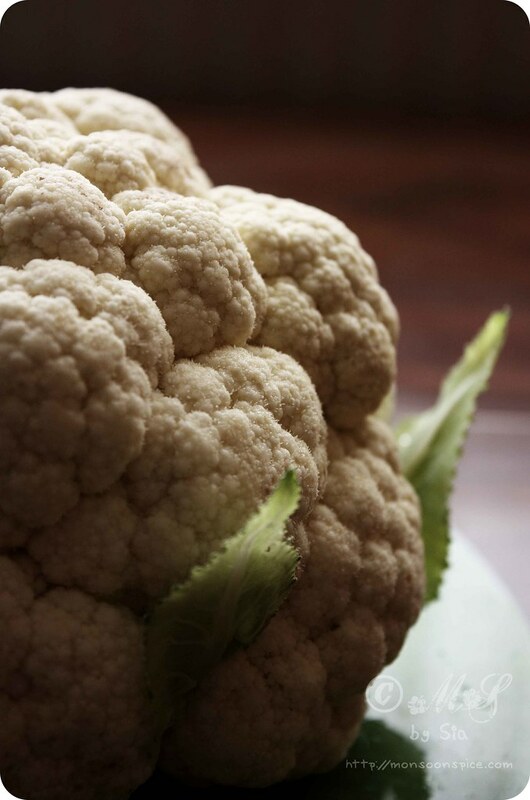 Wash cauliflower florets under running water and transfer them to a cooking pot. Add enough water to cover them along with turmeric powder and cook it for 5 minutes till they are half cooked. Drain all the water by passing through colander and run these cauliflower florets under cold water to stop cooking process. Keep it aside till needed. Take all purpose flour and corn flour in a mixing bowl and add all the ingredients listed above. Mix them well. Now start adding little water at time and keep mixing with a whisk to get little thick batter of pouring consistency. 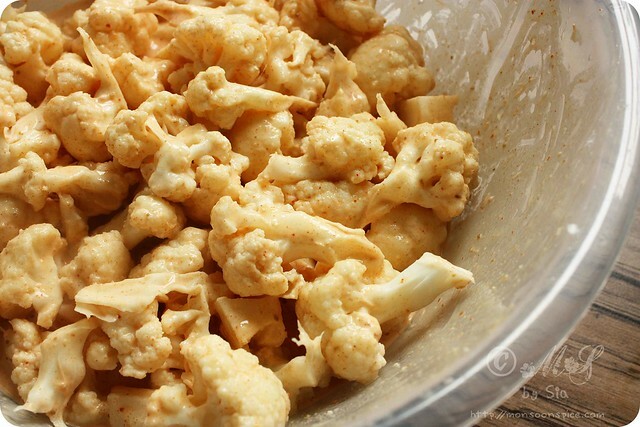 Adjust the seasoning and spices according to your taste and add the cauliflower florets to it. Mix them well so that each floret is coated well. If the batter is little thin, add more flour to it and if it is too thick, just sprinkle little water to it. Cover with a cling film and let it marinate for at least 3-4 hours to build up all the flavours. Heat oil in a kadai or frying pan. To test if the oil is ready, just add a drop of batter to the oil. If the batter drop comes to the surface then the oil is ready for deep frying. If the batter sinks to the bottom of the pan, then wait for few more minutes. Drop individual florets to oil, one at a time, and fry them till golden brown in colour. Place them on a paper towel to remove excess oil. Repeat the same step for the next batch and deep fry them till golden brown and crisp. Gobi 65 is ready to be served with tomato ketchup or proceed to next step. Heat about a tbsp of oil in a pan and add thinly sliced garlic to it. When it starts to turn light golden, mix in finely chopped onions and cook till they turn translucent. Next add bell pepper pieces and toss them for a minute or two. Mix in soya sauce, if using, and toss them for a minute. Add deep fried Gobi 65 and mix them well. Turn off the gas and mix in finely chopped coriander leaves. 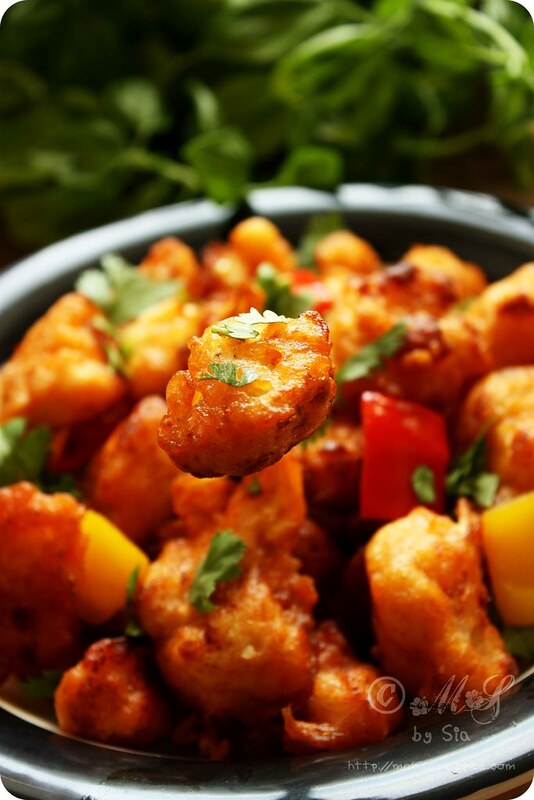 Serve this delicious Gobi 65 with any dipping sauce of your liking or simple tomato sauce/ketchup and enjoy! You can also serve it as a side dish along Veg Fried Rice or Tofu Fried Rice or with any Indian flat breads. 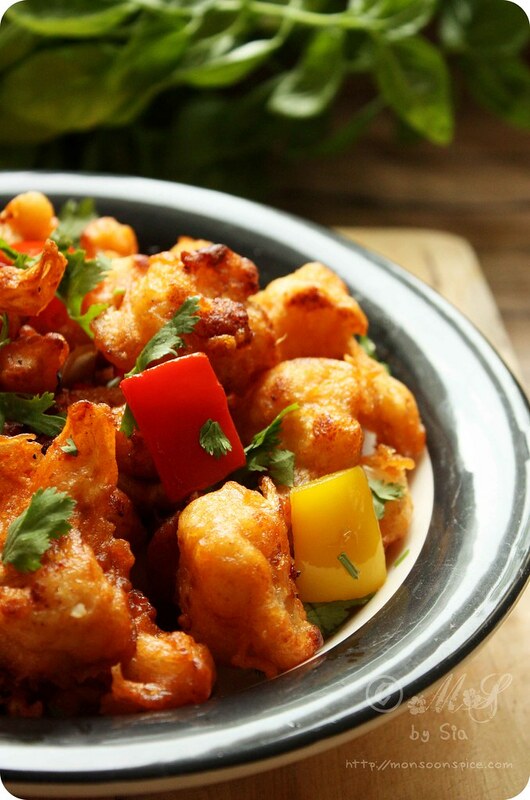 To get Restaurant Style Gobi 65, marinating the cauliflower florets in spicy batter is a must. 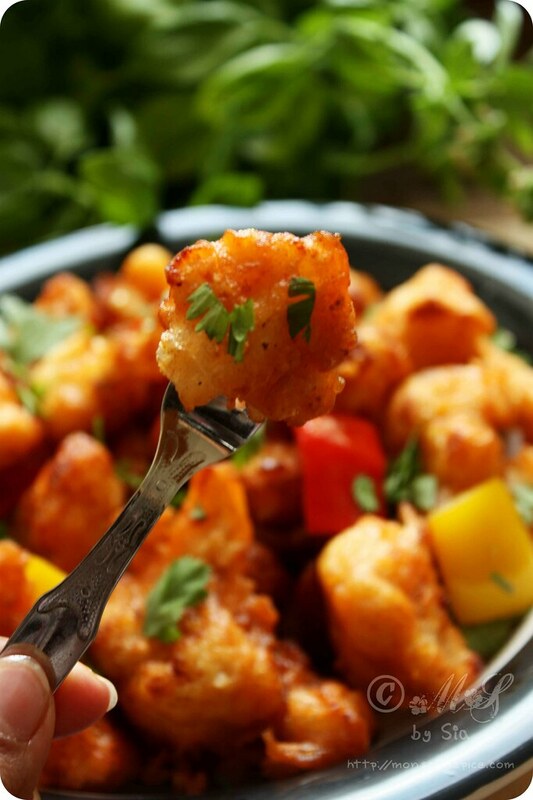 But even if you skip this step, you will still end up having delicious plate of crisp Gobi 65. Make the spicy batter thick enough as the water in blanched cauliflower will make it little thin when added to batter. If by any chance you end up with thin batter, add few tea spoons of maida/all purpose flour or corn flower to get required consistency. You can also add artificial red food colouring as they do in most restaurants. Addition of Ajinomoto or Chinese salt is optional. Do you want to win a copy of Hari Nayak’s “My Indian Kitchen” that has stormed the cookbook world with wonderful recipes and equally beautiful pictures? You can check my review and also you can participate in this Giveaway I’m hosting. This giveaway is open for everyone and the prize will be shipped worldwide!!!! The Giveaway is still open till 15th September, 2011. So what are you waiting for? Please hurry up!!! O M G the dish looks so yummy tempting and inviting to grab. Btw...chilli paste is from red chilli right??? the gobi 65 looks super! and lovely shots! i live in seattle.. and it rains or rather drizzles or tries to rain, 9 months of the year.. so i dont think i can like rain or clouds anymore..:) but i like the mild climate.. though summer same late this year, and we are having a hot 85 degF week in sept right now! It looks sinfully scrumptious, indeed! 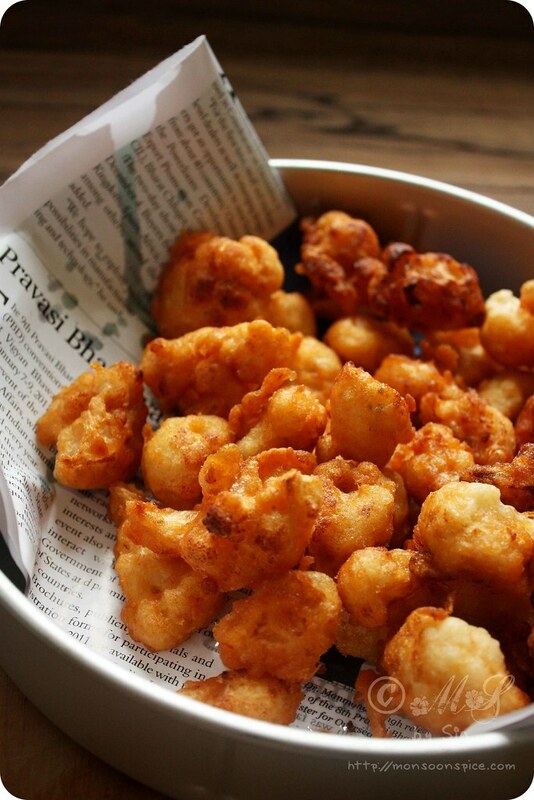 That cauliflower is beautifully deep fried. What a splendid dish. great clicks too! My ever favorite one ..can have this any time and also many time too :)need not say abt your pictures asusual fantastic. Delicious and looks so good. mmm... delicious and beautiful clicks! wow sia!!! u r rocking dear...perfect luking gobi 65,like straight from the restaurant...clicks are amazing. No sin in looking and drooling, we hope! Very well made, looks better than any ol' restaurant version. Great pics, esp the floating cauliflower piece. Awesome pictures. Iam at loss what should i watch the pictures or the recipe or the intro. Love them all. You could send this to my event Sia. Wow! I simply loved reading abt your love for this Gobi 65 :) It is indeed loved by most of us. Prathima, yup. it's red chilli paste. but u can use green one if u like. it won't make much differece to taste or colour. and I've replied to ur mail. Pavithra, ur Gobi 65 looks just YUM! Caysera, so di u make it then? 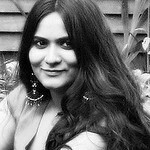 archana, will do the needful as soon as i get some time :)n thanks for ur lovely comment!